The Meerkat is a member of the mongoose family. They are tan with black circles around their eyes. They look in some ways like miniature raccoons and in other ways like cats. They have pointed faces. Meerkats are mammals with small in size. They can grow up to 12 inches in height and weight up to 2 pounds. They usually weigh less than two pound. Their bodies are about ten to fourteen inches long. They have bushy tails that are seven to ten inches long. They have four toes on each foot and long, curved claws. Meerkats are found on the Kalahari Desert in southern Africa. Meerkats eat mostly insects but they also eat some animals as well, such as lizards, snakes, spiders and small mammals. They also eat eggs and plants. Meerkats are carnivorous animals. Meerkats live in underground burrows. They live in colonies which are usually referred to as mobs or gangs. 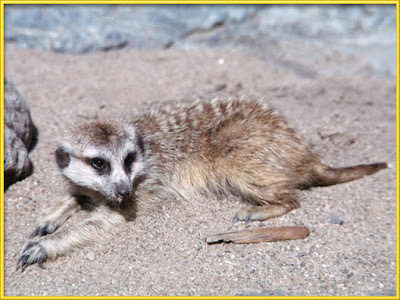 What Are The Meerkat Predators? Some of the people in Africa refer to meerkats as sun angels. They believe that they protect villages from werewolves or moon devils. The Meerkats are highly social animals and they like to play or groom each other. Meerkats are territorial animals. Average size of meerkats territory is 4 square miles. When meerkats stand on their back paws, they balance themselves with their back claws. Meerkats live span is up to 10 years in the wild and up to 13 years in the captivity. Some researchers think that meerkats talk to each other and also sing together.